Of all the cases in this section, I actually think this is the most important one. It is stories like these that are occurring world-wide. Hundreds of people have told me they have had the same kind of experiences as the man who relates this story. 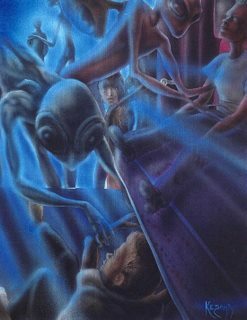 If you, a friend, or a family member has had an alien encounter it is more likely to be like the case that follows than any of the others I have described in this section. Here is how I found out about this particular case: I have a friend named George who is about sixty years old and retired. In October 1996 George attended his high school reunion. In the update year-book that is published after each reunion, George had written that many years ago he had a dramatic sighting of a UFO. Shortly thereafter George received a lengthy typewritten letter from one of his former classmates, Monty. Monty related a fifty-year history of his family's experiences with UFOs and extraterrestrial beings. The letter included drawings of the locations of some of the incidents. * Copies of Monty's original drawings. * A copy of Monty's handwritten February 1998 letter to George. "I believe it was early spring, just after dusk. I was on my bicycle, heading east on Garfias Street to North Roosevelt Street where I lived. I was fourteen years old. There was a bright reflection on my left side. At first I thought it was a reflection on the power line. I realized this light was very high, very large, and the fastest thing I ever saw. It was directly above Mt. Wilson, about a thousand feet and following the main ridge line, heading southeast over Monrovia Peak, Azusa, and Montclair, California. Then, south over Pomona. It was huge. Disk, oblong, white, orange and as big as two Pasadena Rose Bowls put together. It traveled that distance, approximately fifty to sixty miles in about eight seconds, then shot straight up and out of sight." "I was totally shook up and raced home a few more blocks and told my family. They listened, but were very skeptical. They knew I saw something, due to my excitement. I know what I saw was real." "The next day, while reading the Pasadena Star News, there was a small article, 2" x 2", explaining that several people at the Pomona Fairgrounds witnessed this unidentified object for a (few) seconds. An Air Force spokesman had no explanation for the event and that was it, end of discussion." "There is hardly a day goes by that I don't think of that incident of 45 years ago." "My family: wife and four children (twins) Allen and Scott, four years old. David, seven years old; Diana, ten years old." "We were on our way home from San Bernardino, California to our home in Twin Peaks, California, located in the San Bernardino mountains between Lake Arrowhead and Crestline. It was late, 10:30 to 11:00. I was driving a 1970 VW van. We were heading North on highway 18. I decided to turn off on Old Waterman Canyon Road, thinking I could save some time. This is a very narrow road, dark and curvy. This used to be the original road to Crestline and Lake Arrowhead. We were about halfway through, before this road intersects with the newer Highway 18." "The next thing I remembered was waking up with the van parked on the side of this narrow road. In fact, we all woke up at the same time. I never pulled off the road to go to sleep. We were only twelve miles from home. I was dismayed, confused, and very relaxed. Our kids wanted to know why I pulled off and went to sleep, when in fact we were all asleep, or so we thought. We continued home. Betty and the kids went to sleep. When we arrived at home, it was 1:00 a.m. We had been asleep for one and a half hours in an area where I would never pull off, except for a flat tire." "I was so baffled by this event that I found it difficult to carry out my duties for the U.S. Forest Service for a few days. My family never discussed this incident again, until December 1994, when my son, Allen, asked me if I remembered. "Just vaguely," I said, and that was the end of it." "Allen asked me again about the incident. And in an instant, it all came back, what actually happened." "This is what I remembered on that night of 1974, 21 years after the fact." "I exited Highway 18 onto Old Waterman Canyon Road and continued north where the road again intersects Highway 18. I was about halfway, approaching the switchbacks, when I saw lights in my rearview mirror. The lights were approximately 1 mile behind, very bright, and catching up with me. I thought the lights were two motorcycles racing, due to their high speed. I told my family to hang on, as I wanted to put distance between us and them. The lights were almost behind us, very quickly, when I realized the lights were above the road. I thought it must be a helicopter, but there was no noise. Our kids began to yell, "What is it Dad? Speed up." "Now the lights were above us, bluish-white, and I thought there were two red lights. The car was losing power, not missing, just slowing down. Diana was now screaming, David was crying, and the twins were silent. My wife, Betty, began yelling, "It's the Lord. The angels are returning." The car stopped. It felt like the car was dragged to the side of the road. I couldn't move. I could see straight ahead but could not move my neck. It was like a blue fog. I heard the right sliding door open with a loud bang. No sounds from the kids. I heard the driver and passenger doors open. For an instant, I saw movement. I was out of the car. The next thing I remember is waking up, parked on the side of Old Waterman Canyon Road." "My son Allen tells me what he saw and felt. When the lights were almost on top of us, his mother yelled, "They are angels." He somehow got under the middle seat. He could see between the floor and the cushion approximately twelve inches. The car pooped out, stopped. Lots of glowing blue light. So much that it illuminated through the twelve-inch space he could see out of. He was curled up on the floor with his arm wrapped around the seat pipe bracket, and his hands were interlocked." "I could see and think, but was paralyzed. The sliding door opens fast and a loud bang. The front doors open. I could see them through the open side door. They looked like giant bugs, long, spindly arms and huge bug eyes. Like a praying mantis. Dad, they take you and mom first. Mom was still screaming. Then Dave, Diana, and Scott. I'm last, but they couldn't release my grip from around the seat bracket bar. The bugs tell me to relax. I can't, nor would I voluntarily. My body becomes relaxed and they release my grip. I'm terrified and again, paralyzed. It was like I just floated out and up. Bright, bluish light. I'm inside a dark place and then I wake up, in the car, parked on the side of the road, wondering if I had a bad dream." "Scott, Diana, Dave, and my then-wife Betty remember the event as I did. Betty refuses to discuss the event, becomes very emotional." "This event remained hidden in our brains for twenty-one years, until December, 1995, when Allen said, "Do you remember?" "Twin Peaks is on a ridge top that is located between Crestline, California and Lake Arrowhead. Our home was located on top of the ridge at approximately a 6,000-foot elevation. There was snow on the ground and I believe it was March or April when this next incident occurred." "We lived in a two-story Victorian style home. It was very dark that night and all four children were on the second floor quietly playing, which in itself, was unusual. It was too quiet. My wife Betty and I were reading on the first floor. The kids began screaming their heads off, yelling and crying. An extremely bright, bluish light from outside completely enveloped our home, inside and outside. The kids ran downstairs and I ran outside. This very bright light had just moved to the north, below the ridge top. And light was radiating through the pine trees. This event lasted no more than ten seconds." "The kids were scared to death to go back upstairs. We were just baffled by what happened. There was no noise from the light. I asked local people if they saw this and none did. No reports were called in to the local sheriff substation. I just couldn't believe no one else witnessed this event. The San Bernardino Sun newspaper had nothing about unusual lights." "The last event took place from our home in West Hemet." "It was an early fall night at approximately 10:00 p.m. I had just stepped outside and was looking towards the east. While looking towards the mountains, I noticed a very small, bright light that began to move extremely fast in one direction, then quickly shoot in another direction. No human could survive the G-forces of that type movement. I estimated this light would move ten miles in one second, then instantly go in the reverse direction. This went on for about thirty seconds and the light shot out of sight. I believe this occurred east of the San Jacinto mountain range, near the Anza-Borrego desert." "There was no mention of this event on radio or TV." "I wish our government would quit spoon-feeding little tidbits of information. We all know something is going on and there is earthly involvement by humans. Until those who know the truth come forward, it will remain a mystery." Thank you for taking the time calling me on the A&E program. Good program covering all aspects of UFO abductions etc. What bothers me, is all the records are gone on Roswell (destroyed) and probably on all sensitive UFO sightings and abductions that the Govt. kept secret. I don't think the Smithsonian museum in Washington D.C. has anything. What happened to me and my family has profoundly affected me. The ancient world engraved their events in stone. It worked for them, 8,000 years and it will work for me. I engraved a saucer and electrical force field with a hammer and cold chisel, summer of '97. I feel more people should put their important events in stone. It may take another 1,000 years to solve the secrets of Government. It's nice to know that you are separating fact from fiction and keeping the awareness level up high.